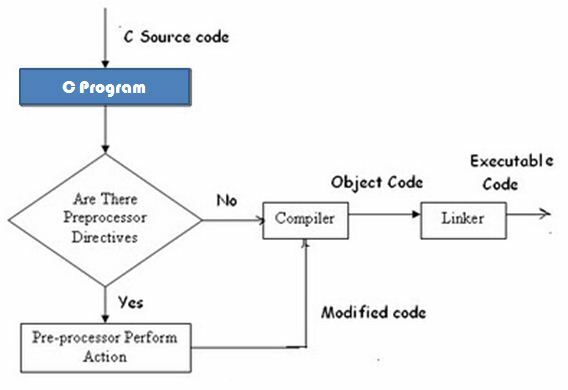 We all know that preprocessor comes before compiler so complete source code will be first processed by the preprocessor and then output will be given to the compiler. Suppose we have written above C Program.Let us say name of program be hello.c . Now we are going to feed this source code to preprocessor before compiling. Step 2 : Is there any C Preprocessor Directive ? Now second steps is to check whether there is any preprocessor directive written inside the c program that can be processed by preprocessor.Meaning of preprocessor is to process it before. Preprocessor directives are processed before giving source code to Compiler. First Preprocessor will check whether given source code contain any pre-processor directive or not. We can see all header files are removed.New lines are replaced by spaces and all large spaces are replaced by single space. Preprocessor Processes Source Code before giving it to compiler.